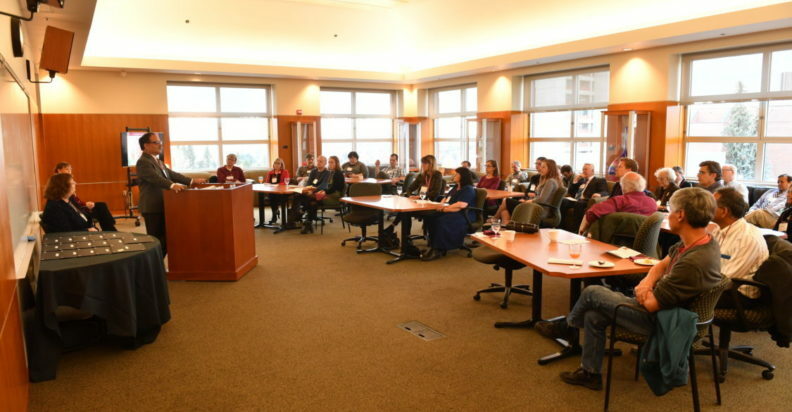 On November 1, 2017, ATL and the WSU Vice Provost for Undergraduate Education hosted an Inaugural Celebration of Assessment Excellence, honoring sixteen undergraduate programs on the Pullman Campus with exemplary assessment practices. Along with Provost Daniel J. Bernardo and Vice Provosts Mary F. Wack and Erica W. Austin, ATL is delighted to recognize undergraduate programs, departments and schools where program-level assessment is well-established, thanks in large part to the efforts of faculty assessment coordinators, chairs and directors. The following undergraduate programs were recognized for their mature assessment systems, where meaningful measures of learning are regularly collected and faculty are involved in interpreting and using the results to refine curriculum and instruction, and the development of strong assessment practices that engage faculty in assessing student learning and in using assessment results to inform decision-making. For more information about the event and programs recognized, see the event program and ATL News. AMDT demonstrates a sustainable assessment system that includes faculty and industry representative evaluation of senior capstone projects using a juried process, complemented by focus groups and surveys bringing in student perspectives. Faculty monitor student achievement and regularly make adjustments to curriculum and instruction, and regularly review learning outcomes and update assessment as needed. Bioengineering brings a longstanding practice of using assessment results to inform changes to curriculum and instruction. Faculty score course-embedded assessments in capstone and other courses using rubrics. Other assessments include advisory board input, student exit surveys, and a professional skills assessment. Leadership, assessment committee, and faculty discuss assessment multiple times throughout the academic year. Civil Engineering has a strong record of using assessment results to improve courses and curriculum. Well-established assessments includes a national professional exam, senior capstone projects evaluated by faculty and advisory board members, a professional skills assessment, and assessments by faculty and lab instructors. Regular advisory board discussions and mentor surveys provide additional key feedback. Computer Science applies thorough and systematic assessment planning and decision-making processes, and regularly uses results to improve curriculum. The program collects a suite of assessments, which include faculty evaluation of senior design projects and reports, a professional skills assessment, and a required senior exit survey. An advisory board also provides professional input to the program each semester. Economic Sciences demonstrates a 360-degree assessment system of sustainable practices using multiple, complementary methods: faculty assess capstone projects, internship mentors evaluate student skills, and students self-assess. Faculty regularly engage in assessment, use results, and implement innovations to improve learning, such as redesigning capstone course and incorporating new course modules. Human Development demonstrates a well-established multi-campus assessment system that includes its fully online degree. Learning outcomes-aligned complementary measures are collected at all campuses, including evaluations by faculty and internship mentors. Results are regularly shared with faculty and data are used to guide changes to courses and instruction. Faculty address performance differentials among students on different campuses. SMB demonstrates an active, responsive assessment system where faculty use multiple assessment measures, including adapting several national instruments to assess students at entry and exit points. The program gathers input from students, and correlates student achievement results with student demographic data. Faculty use results to improve curriculum and pilot transformative instructional approaches. Neuroscience uses a suite of measures to inform continuous improvement efforts. Well-established assessments, including senior capstone and focus groups, provide data used to improve student learning. Faculty regularly use results to make curriculum changes, including more intentionally scaffolding concepts throughout program. The program also implemented a research mentorship program based on assessment results. The Teacher Education program has adapted external assessments to a local context on multiple campuses. Faculty use results from high-stakes external performance evaluation, and a suite of aligned measures across the curriculum, to guide changes to curriculum and instruction, and academic support services. The assessment team includes all faculty, advisory board, and a teacher education committee with student representatives. RCI & WSU Libraries partner to assess students for UCORE and to provide useful results to RCI faculty. This sustained collaboration assesses learning outcomes achievement and faculty use results to adjust instruction, assignments, and course design. This mature system of norming and rating student work has scaled up to include representative samples from all campuses, accounting for nearly 5000 students a year system-wide. AFS and IPS interdisciplinary faculty collaborate to create and assess effective capstone courses with industry partners. Both programs are creating rubrics to track and measure learning development throughout the curriculum. Faculty also combine effective assessment and professional development by improving assignment design. The Department of Chemistry collects American Chemical Society standardized exam data, allowing faculty to assess student performance at the beginning and end of the program, and faculty also assess senior poster presentations. Additionally, the program has a strong record of using results to inform decision-making to augment instruction and courses. History faculty provide assessment data from all courses and campuses as part of their teaching, giving the program a comprehensive view of student achievement. History target one learning outcome each year, for a sustainable practice. Faculty regularly discuss performance expectations for student success, which helps faculty provide more consistent feedback to students. Landscape Architecture faculty use several quality assessments, including junior design projects assessed by faculty and senior design projects evaluated by both faculty and an outside professional panel of jurors. In addition, assessment rubrics are modified for students to self-assess themselves – engaging them in critical reflection. Psychology faculty at all campuses regularly assess student performance in core courses using a faculty-developed program rubric with strong participation by instructors. Assessment results show student development at key points in the curriculum, and faculty use these results to inform curriculum changes.